It's a pretty Pop-Tart... and that's almost all there is to say. This is a standard Strawberry Pop-Tart dressed in funky new clothes. 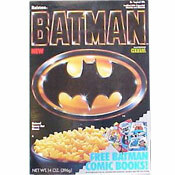 If you like the original, go ahead and get all "wildlicious" with this new product. It might be a little sweeter and the pastry might be a little more browned, but it's the same basic product. 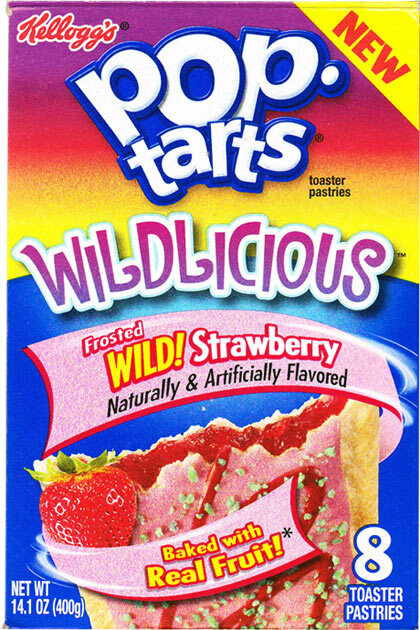 Because the pastry is slightly "pre-taosted", this Pop-Tart is little better than similar products when eaten un-toasted. If you're toasting, remember to toast twice on the lowest setting, as opposed to once on medium. The Pop-Tart will be more evenly heated and you'll reduce the risk of burning it. Nutritional Considerations: Each single pastry serving has 200 calories, 5 grams of total fat (1.5 grams saturated and 0 grams trans), 170 mg sodium, 36 grams total carbs, less than one gram dietary fiber, 15 grams sugar and 2 grams protein. As with all Pop-Tarts and sweet breakfast pastries, Mr Breakfast recommends that you "treat" them as a rare treat to be enjoyed only after you've had several days of healthier breakfasts to offset the nutritional void. 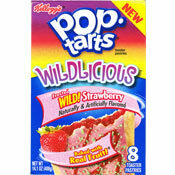 What do you think of Strawberry Wildlicious Pop-Tarts? They're just the same as the regular Strawberry kind. I liked them alright. To eatright: That sounds gross. It is not just as good. Poptarts are really bad for you... just saying instead of Poptarts (they're good every once in a while), you should have yogurt and fruit. It tastes just as good!